To celebrate the release of my debut book, I’m having a scavenger hunt. I will be on several blogs and sites from February 14th-23rd. http://caitjarrod.com/ will have the list and links to direct you to the next site. · At each site, I will have an excerpt for either Kidnapped Hearts or an unedited excerpt from one of the sequels, Deceptive Heart’s and Mystic Hearts (a novelette). His eyes studied every inch of her face then his head lowered. His lips were gentle and passionate. _____ kiss, although brief, left her feeling hope. Hope that she will get through this and hope that maybe, just maybe, she’ll get through the turmoil that has become her life. The moment of heightened awareness when the hair on your neck stands, anticipating the next minutes when you either plunge into action, gripping the edge of the book, or fall into another’s arms, swooning. 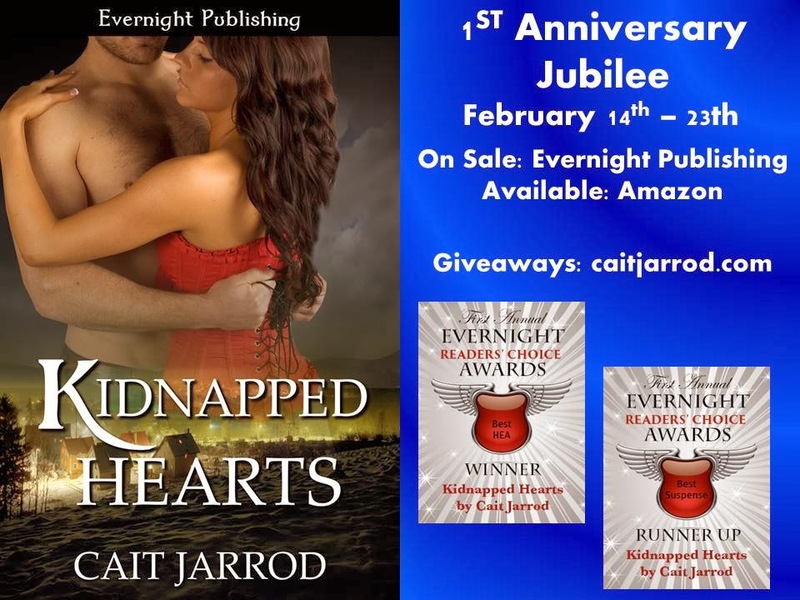 Kidnapped Hearts, the first in the band of friends’ series, will always be special. Not only is it my debut novel, the setting takes place near my hometown. Settings and names of good friends and love ones in the story add to my sentiment. Woohoo! Now this is a tough one!! I shall look out for those missing words, good luck Cait. Thanks, ladies and thanks to Maureen and the Just Romantic Suspense gals for having me! I love a hop that actually makes me think.